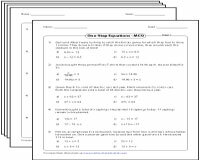 One-step equation worksheets have exclusive pages to solve the equations involving fractions, integers, and decimals. Perform the addition and subtraction operation to solve the equations in just one-step. 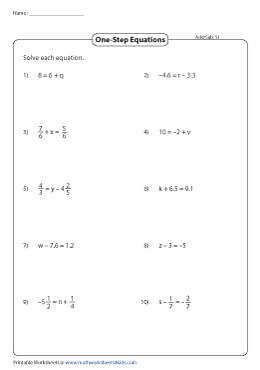 In these worksheets, solve each one-step equation using addition and subtraction operations. In 'Level 1', all the integers and variables given are positive. In 'Level 2', both positive and negative values of integers are used in each equation. Each worksheet has 10 problems for practice. In these worksheets, a variety of one-step equations which involve addition and subtraction of fractions are here for children. 'Level 1' contains equations with proper and improper fractions. 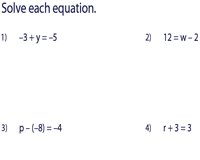 In level 2, one-step equations have mixed numbers as their coefficients. 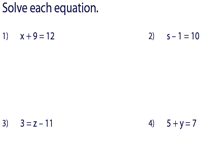 Convert the mixed numbers to fractions and solve the equations for a complete practice. 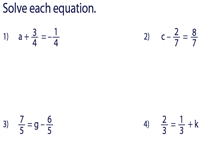 This section involves addition and subtraction operation to solve each one-step equation. Decimal numbers are the only terms used in these worksheets. 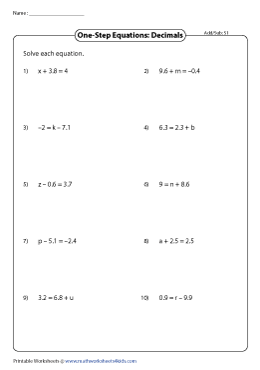 Each worksheet has ten equations which involve addition and subtraction operation. 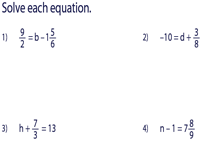 A combination of integers, fractions and decimals are used in these equations. Access this series of tenaciously prepared one-step equation word problems that require multiple arithmetic operations to solve them.